Cercle de Basse Saxe ou sont distingues les Etats de Brunswich, les Duches de Holstien, de Mecklenbourg et des Eveches d'Hildesheim, et d'Halberstadt. 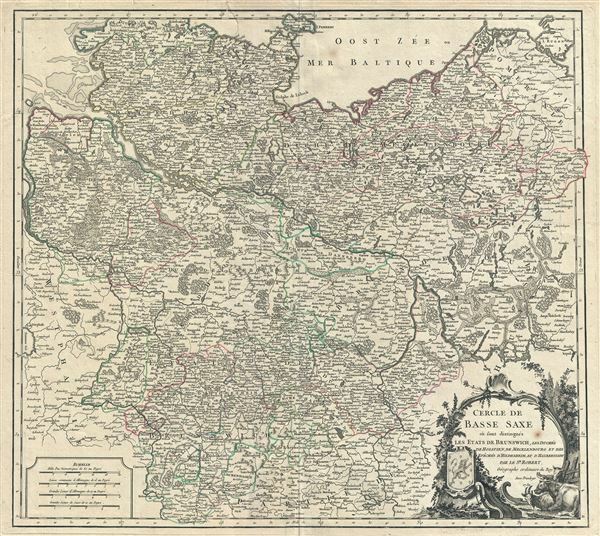 This is a fine 1751 map of Lower Saxony, in what is now Central Germany by Robert de Vaugondy. As shown here, Lower Saxony was bordered by Denmark and the Baltic Sea to the north, Westphalia to the west, Pomerania to the Northeast, and the Circle of Upper Saxony to the south and west. It includes the circle of Lower Saxony and the states of Brunswick, Holstein, Dutchies of Mecklenburg and bishoprics of Hildesheim, and Halberstadt, and extends from Halle (Saale) north to Stralsund and from Berlin west as far as Diepholz. The entire region is depicted in extraordinary detailed, offering both topographical and political information, with forests and mountains beautifully rendered in profile. Lower Saxony was one of the 'imperial circles' created by the Holy Roman Empire in the 1500s. These groupings of regional territories were designed for defensive, tax, and administrative purposes within the Empire. During the French Revolutionary Wars, the Hanoverian Duke and British King George III allied with the Prussians against Napoleon, which nonetheless did not prevent the French ruler from briefly invading and occupying the territory. A beautifully engraved title cartouche adorns the lower right quadrant of the map with a coat of arms surrounded by floral ornaments and animals. Issued in the 1757 issue of the Atlas Universal. The Atlas Universal was one of the first atlases based upon actual surveys. Therefore, this map is highly accurate (for the period) and has most contemporary town names correct, though historic names are, in many cases, incorrect or omitted. Very good. Original platemark visible. Minor wear along original centerfold. Light foxing. Rumsey 3353.059. Pedley, Mary Sponberg Belle et Utile: The Work of the Robert de Vaugondy Family of Mapmakers, 261, state 2.